Stretching from the north shore between Hanalei and Princeville to the upper east side of Wailua, the 10 mile Powerline Trail is an unmaintained dirt road which is perfect for a long, tough running route. It’s also a good opportunity to explore the green interior of the island, yet the trail climbs high enough to offer the occasional ocean view. There are also nice vistas of Mt. 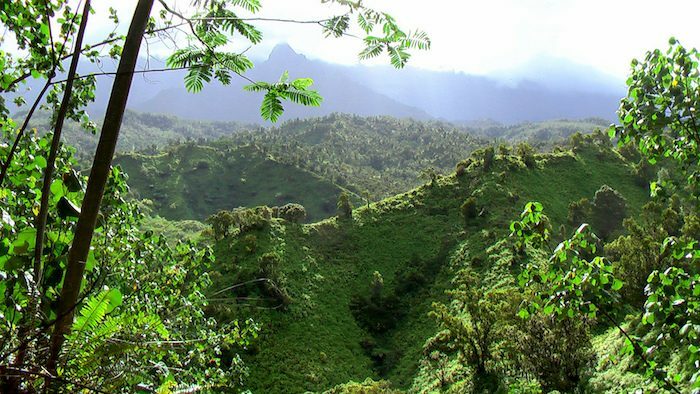 Hihimanu and beyond, as the route follows the eastern boundaries of Halelea Forest Reserve to the Keahua Forest Reserve. Depending on how long you want to run, the Powerline Trail can be accessed from either side. For a short run, the two miles on the Princeville side are more popular and better maintained. However, if you make it all the way to the Wailua end, the bonus is a cool swimming hole complete with a rope swing. Try to go in dry weather as this trail can get both slippery and muddy.